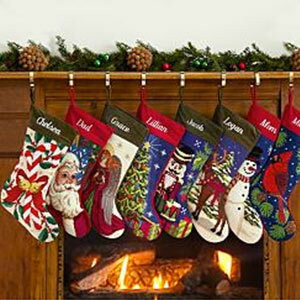 Beautiful stockings to hang on your mantle this year. Vintage Handcrafted Needlepoint Stockings have homemade appeal with exquisite detailing and vintage designs. Add these keepsake stockings to your Christmas decor for an old fashioned touch, or give them to friends and family members as personalized early Christmas gifts. Mix and match from eight unique designs, or order matching stockings to create the look you desire. These handcrafted stockings are sure to dress up your mantle and compliment your other Christmas decorations this season, and for many Christmases to come. Purchase these unique vintage handcrafted needlepoint stockings today for every member of your family, and add a warm, homemade touch to your Christmas.